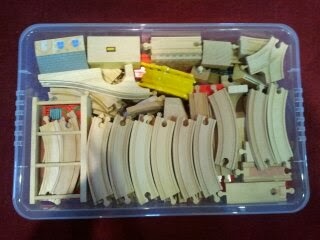 This morning I decided it was time to pack away the wooden train-set. Over the last 12 year we have accumulated quite a selection of track and bridges however the farm has taken over and the train set is no longer played with. When the boys were younger the track took over the playroom and we used to love making new tracks and seeing if we could incorporate every piece of track and bridge in the layout however it has been on the shelf for a long time now and the time had come to put it away. There is a huge collection of trains with a good number of ones from the Thomas the Tank Engine series. We also have a set of Bob the Builder characters that go on the tracks that William collected when he was younger. 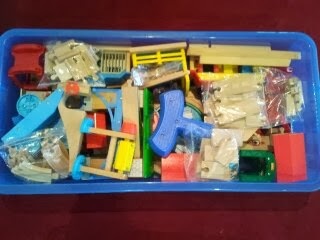 There is a mixture of Brio, Early Learning Centre and Tesco sets which have been accumulated over the years at birthday's, Christmas and special treats for being good and each piece has it's own tale to tell. It was quite sad putting it all away for the last time and also quite a challenge getting it all to fit in the three storage boxes I had decided to use. Eventually, after a lot of juggling with bridges I managed to get everything to fit and the lids to close! 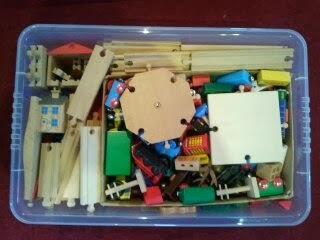 As the train set has been part of our lives for so long I am not getting rid of it, instead I am putting it upstairs and keeping it for when the boys have their own children and then we can all play with it again. I am sure their children will have just as much fun playing with it as they have.